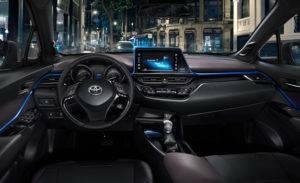 After making its debut as a production model at the LA Auto Show, and then appearing at the North American International Auto Show (NAIAS) and the Chicago Auto Show, Toyota’s C-HR will head over to Toyota dealers. Toyota’s first foray into subcompact SUV territory, the 2018 C-HR (the moniker stands for “Coupe High-Rider) is scheduled to be available for sale at Toyota Dealerships later this year. We think you’ll be excited when you see this latest addition to the Toyota lineup. Stop by out dealership and ask our sales staff about the Toyota C-HR. They’ll go over all the details of this sensational new subcompact SUV and answer all your questions.